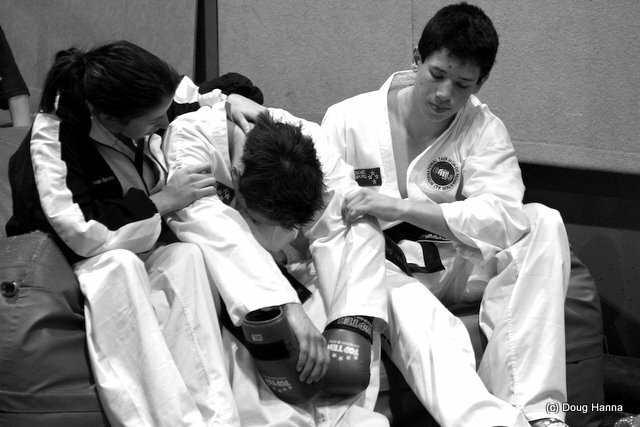 Jeremy Hanna is upset after loosing the deciding match in Junior male team sparring in the 2007 World Champs. He drew the match and scored the first point in the sudden death but only 2 of three judges saw the point. His opponent then got the next point which was seen by three corner judges. Loss to NZ. He's gutted. 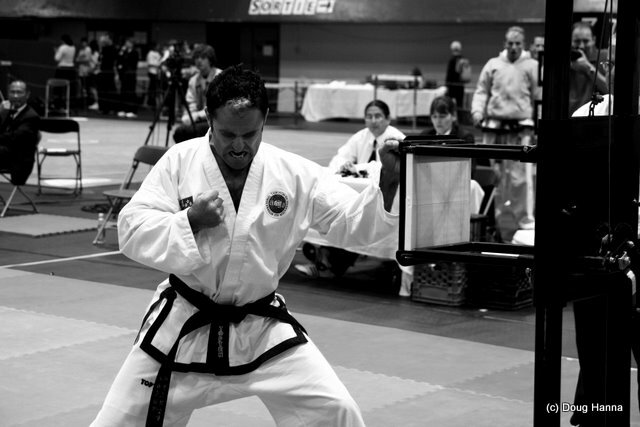 Prior to my involvement in photographing Taekwon-Do I felt quite uncomfortable in photographing people. 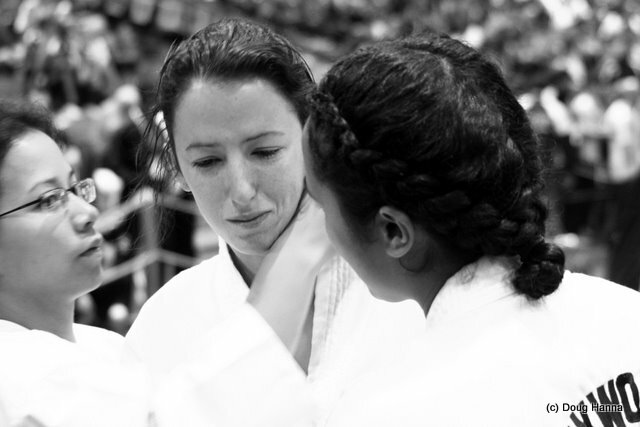 TKD was a wonderful opportunity to get close to people and, over time, people getting more comfortable with me taking lots of photos of them too! As I've written before, I prefer snapping images while the subject is involved in their activity rather than set-up or posed situations. I feel that it removes the element of self consciousness, and you get the opportunity to try and capture something of the natural character and personality of the subject. What I really like to capture in a portrait is some emotion. The difficulty is that big outbursts of emotion often happen within seconds, often last only a split second and they're rare. I've seen teams perform high fives and missed the shot by seconds. I've finished taking photos of a sparring match and missed the elation on the face of the winner when the decision is announced. New Zealander's don't let their emotional guard down often. We're typically more emotionally reserved than for example Italians, Argentinians, French and even the Irish! 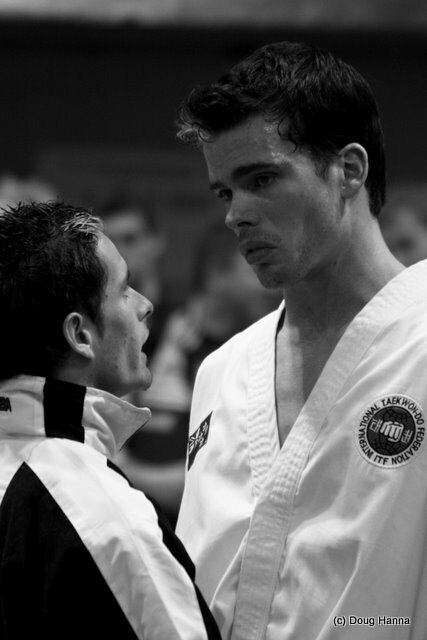 And in Taekwon-Do the biggest bursts of emotion is observed at major international events such as the World Champs or World Cup. At these events the stakes are high, competitors have been training for the few minutes of the event for a year or more, and they will either win or lose. Win = elation. Lose can be devastation, depending on the hopes of the competitor or how close they were to winning. In preparing for this article I looked through the 2007 World Champs images and found only 4 showing dissapointment. Part of the lack of these images is that I feel awful taking them. It feels cruel. But part of me says that to only take happy photos is missing out on an important part of the journalistic aspect of covering these events. And there are wins and losses and why should we just focus on the wins all of the time. And 4 "down" photos out of 2200 "selected" is only 0.2% - that's not many! Over time I've gradually learned to look around at the end of a match to capture the emotions of the competitor, team, seconders, coach etc. I find it hard to remember to do, but some of my most powerful emotional images have been taken at this instant. And so often, when it is "loss" I don't take the picture then are cross with myself when I notice that I missed an important moment. Under the pressure of the competition, Jon Sawden has just missed the punch that he always gets. PS: 21/6/09 - I spotted myself in the top right hand corner of this image which means that I didn't take it! We owe this and the other images of Jon taken from this angle to Regan Diggelmann who had grabbed one of my cameras and spent time shooting some events that I couldn't cover. Carl van Roon was knocked down in his sparring match against Netherlands where he looked to be ahead. The referee called for the tournament Doctor. He stopped the match which was near the end anyway and they awarded it to Carl because it was determined to be caused by excessive contact. However, it also meant that he couldn't compete in the semi-final which he had just qualified for and the expression on his face tells you how he felt about that. Estee Speirs has just dropped out of medal contention (we think from memory she had dropped to 4th place) in senior female special technique. While the dissapointment is huge in these images, we can be encouraged by the support the competitors receive from their team mates who know what it feels like. I feel that these are powerful images, conveying so much in an image that words struggle to convey. I'd be interested in hearing what you think about me capturing these moments. Click comments below and let us all know what you think about it.